To fulfil the brief we first got into groups and brainstormed ideas of books to base a game on, we came up with several fairy tale story’s like Snow White, Sleeping Beauty and Little Red Riding Hood, but in the end we decided to go with the Little Red Riding Hood survival concept we came up with. We then expanded on the idea and decided to set it in London around the time of the Jack the ripper killings. We then researched maps of London and old architecture as well as some of the information on the ripper killings. With all the information gathered we then plotted a route on one of the maps this would be our level. We then drew a map with rough scale measurements on how long the streets should be and how wide the alleyways were. I then took this map drawing and worked together with Ryan to make a copy in Google Sketchup, we also added the points were you could hide, couldn’t access, tutorial points etc. with colours and added a key so we wouldn’t forget and the rest of the group could understand easily. With the basic layout made everyone in the group made their own houses to put in the level, this was there would be more variation and make it look more visually pleasing then a level populated with just one or two buildings. I was very pleased with my building design and used custom textures. I also make the sides as septate panels this way my house could be put next to another one without bits sticking out the side and if it was at the end of a street you could just slide a panel onto the building. I also made street lights, lanterns, fruit stand and a wagon these were to be used to add more detail to the streets and the fruit stand and wagon were going to be used as roadblocks in some areas stopping the players progression. We then started to place all of the houses on the map, we each took this in turns before we broke off for Christmas. 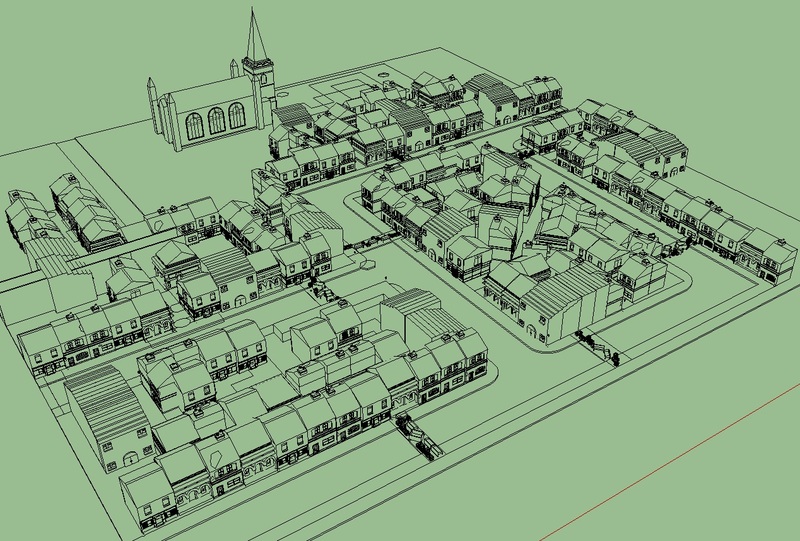 For the holidays we each were given one section of the map to do and I was given the job of positioning the houses in the upper centre area, the lampposts and creating the roadblocks (as mentioned earlier). We all then met up before the hand in and combined all our separate files to create the final result. Overall I am happy with the final outcome; I also think our teamwork was good because everyone finished their tasks and communicated with each other sharing thoughts and opinions as well as help if something wasn’t going right. 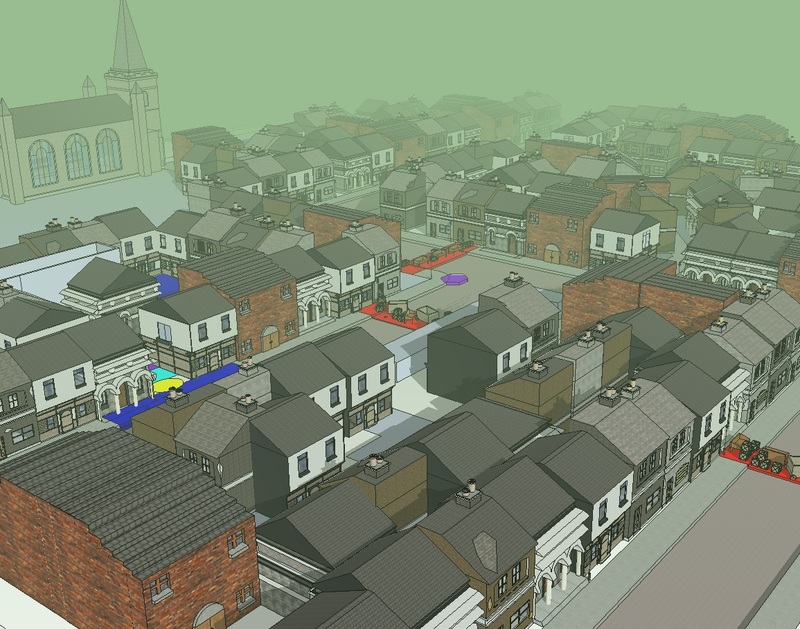 But if we had more time I would have liked to add more custom textures and have a wider verity of houses. I also think the wagon could have been made better if I spent more time on it or used the warehouse to get existing models and combined pieces to make something new that looked like it fit in the time period. My second job on the Little Red level design was to make some roadblocks to block some of the roads to stop the player taking that route. I decided to make a cart and a fruit stand as they seemed to fit the time period. I then added the road blocks into the house pallet to be easily placed in the level. We all took it in turns to place houses on the map until we broke off for Christmas. This is the final house pallet we put together with everyone’s houses and the street lamps. We then assigned everyone a job to do over the holiday. I had to finish placing buildings on the upper half of a street and alleyway in the center of the level and make the road blocks. Here is the finished house layout of the section I was given. Once I finished making my house I decided to make a Victorian style street light one to stand in the street and one to clip on the side of a house. This is an image of the lamp in use on the streets of our level in its early development stages. After creating the basic layout for the map everyone in the group made there own houses to put in it to add more verity than if just one person made every house. these are the development shots of my victorian style house. I decided to make the side panels separate so the house could fit nicely next to any other house without them and can be added to either side if its on its own or at the end of a street. I re-used the windows from the front of the house on the back of the house. I then made another version of my house with the front side panels missing. The next step was adding textures and a roof. I then made a pallet of my houses by making a grouped version of every combination possible: no side panels, both side panels, left side only, right side only, left side attached and right side attached. this will make it much easier to select the grouped version of the house you need to place on the map instead of spending time trying to line up the side panels when you need to attach them. 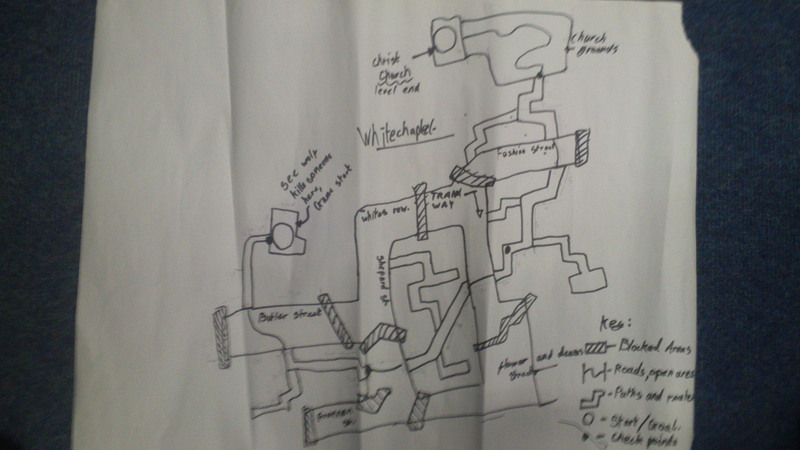 Map Design for the Little Red Level. 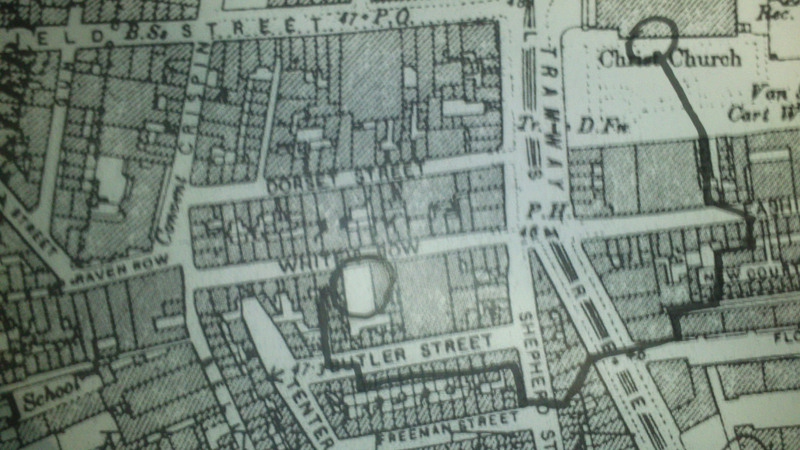 We started by looking at maps of London that dated around 1889 (close to the end of the Jack the ripper killings) focusing mainly on the Whitechapel area. we looked at various maps but in the end mainly focused on this one selecting the Christ Church area to set our level in. because of their greenish colour. terrible lives was drink and they quickly became helpless alcoholics. I liked the idea of the smog and think it will make a great device to build tension and keep the players vision to a minimum making it harder to navigate round the level. We then brought all our research together and talked about what we liked and disliked then worked together to do a rough sketch of the map after marking our level route on the existing map. We then added a key to help us remember what each colour represented and to make it easier for the others in the group to understand what was going on. Level Ideas Based on Books. Get through the forest before the big bad wolf gets you. Have to hide from the wolf if he’s nearby climbing trees and hiding under over hanging tree roots. Wolf could be alpha male of pack so you see the little wolfs first as a warning sign he’s close. Lil red is quick and agile big bad is slow but strong. Grandmas house is goal wolf still gets lil red. A set forest path with multiple hiding spots at sections. You hear the wolf’s voice taunting you and it gets louder the closer he gets. You have a lantern to light your way and a limited number of flint to re-light the lantern and you have to put it out to not attacked the wolf when he is near. Lil red could be hunting down the wolves and stealth fully taking them out to get to grandma’s house. Storming the castle to take it back from evil step mother. RPG game-play leveling up in the forest to gain the skills to take back what is rightfully hers. Dwarf running to reach snow white before she eats the apple. Snow white killing huntsmen in the evil forest. Dream world where you have to escape the dream world to wake up. Settings, Forest, town, back alleys, sewers, junk yard. Lil red could be killer running from police. Lil red could witness a murder and be chased by killer. – She has blood on her hands leaving a trail on everything she touches. Set in Victorian times, London. Stamina bar – could be represented by the characters breathing. Can climb onto roofs and do free running. Lil red needs to hide to recover stamina. Killer is shrouded in shadow and you only see the glow of his eyes and his smile or his face is only lit up when he lights a cigar. Goal could be police station or church. Multiple routs with dead ends. Could be hinted you will be killed at the end but fade to black before anything happens. If jump scares are used they should only be used twice this will build dread in the player as they are expecting more but they never come because jump scares are not scary but startling unless they are earned with build-up causing dread. If you have too many they become annoying. Little red witnesses the murder of a woman around her age and sees a shadowy figure stood over the body holding a knife dripping with blood. The figure slowly stands and turns to face you then puts his finger on his lips and goes “shhhhh” and then grins menacingly and starts to walk towards you. You immediately turn and run then the game play begins. When you make it to the police station you are given a blanket and are sat with explaining your story to the officer on duty he turns with a drink in his hand and says “shhhhh it’ll all be alright now” and smiles menacingly looking identical to the smile on the killer then the game fades to black.